The riches close to Melbourne just get better with the Mornington Peninsula, a two-hour drive from the Yarra Valley or just one-and-a-half hour’s drive from Melbourne. It’s one of Australia’s more picturesque locales boasting silvery olive groves, rolling hills laced with vineyards, waterfront cafes and restaurants, roadside signs for strawberries or free-range eggs and lively local markets. and climates produce an exotic array of wines - predominantly Pinot Noir and Chardonnay. were abandoned or uprooted. In 1972 some aspiring vignerons recognised the potential of the peninsula for producing high quality, cool climate varieties. What to try? Choose from the hallmark pinot noir and chardonnay, along with excellent pinot gris, pinot grigio, sauvignon blanc, riesling, semillon, shiraz, cabernet sauvignon and merlot. Start your day at Montalto Vineyard and Olive Grove. 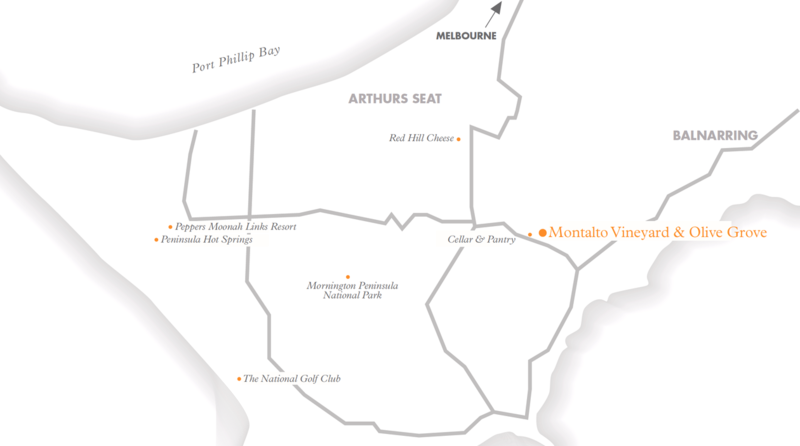 Montalto produces premium cool climate wine on the Mornington Peninsula, a beautiful region with rolling hills, orchards, olive groves, historic mansions and more than 200 vineyards specialising in pinot noir and chardonnay. Montalto has been awarded Best Winery Tourism Destination by Gourmet Traveller magazine and given a 5-star rating by Australian wine critic and vigneron James Halliday. 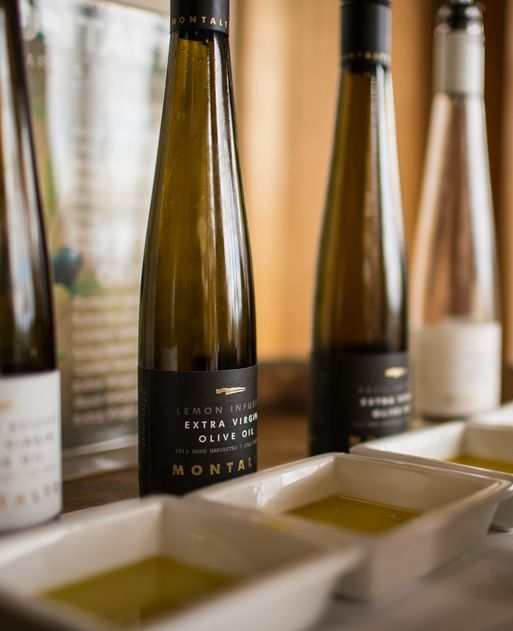 Indulge your senses with a three-hour Estate to Plate wine tour experience or a four-hour Winery Tour followed by lunch in Montalto restaurant. Visit Montalto’s Winery and experience first-hand the winemaking and grape growing process with this unique behind-the-scenes tour, hosted by Montalto’s highly awarded wine making team. A tour of the winery will demonstrate how it’s done and why, together with the little things that make a difference. This is a guided tour of the property with a seasonal theme. The Estate’s working vineyard and olive grove, kitchen gardens, fruit orchard and berry plantation are interesting at any time of the year. Montalto has been awarded Best Winery Tourism Destination by Gourmet Traveller magazine and given a 5-star rating by Australian wine critic and vigneron James Halliday. Work off your lunch with a leisurely walk around the Montalto Sculpture Collection. 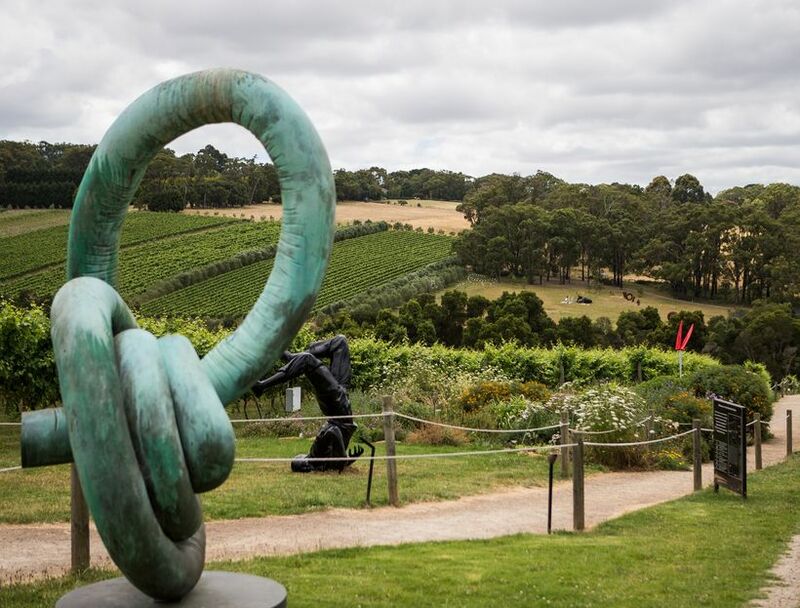 It was Montalto owners John and Wendy Mitchell’s desire to combine their passion for the arts with their love of nature and growth that was the birth for the Montalto sculpture collection. The growing collection features works from a number of Australian artists including Sebastian Di Mauro, Marcus Tatton, John Kelly, Phillip Doggett-Williams, Michael Needham and David Waters. Sculptures are sited throughout the property for visitors to enjoy on a meander throughout the estate, or to contemplate as they enjoy lunch in the restaurant or Piazza Cafe. Other relaxing alternatives including bathing at Peninsula Hot Springs or a visit to Main Ridge Dairy. Taste the flavours of the Peninsula with the luscious local produce at restaurants that are garnering plenty of acclaim. 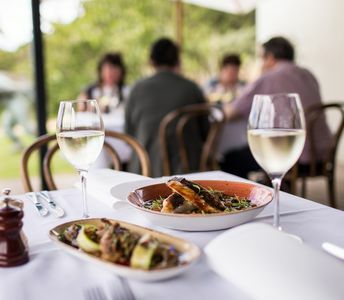 Indulge in degustation menus and share plates of garden harvests with friends at La Petanque Restaurant, Montalto Restaurant, The Dining Room at Port Philip Estate, the restaurant at Ten Minutes by Tractor and The Long Table. Alternatively Le Bouchon is a great little French bistro in Balnarring, with local people, charm and hospitality. Overnight at Peppers Moonah Links Resort at Cape Schanck or the Flinders Hotel on the Mornington Peninsula. Try some amazing golf on the Mornington Peninsula and play 18 holes of golf at nearby golf course The National. On the culinary front, a number of high-profile Melbourne chefs have now discovered the joys of living - and cooking - on the Peninsula, using local organic vegetables, aged meats, fruits from cherries and bio-dynamic apples to blueberries and quinces, olive oil, seafood, preserves, coffee that’s roasted on demand and local cheese. 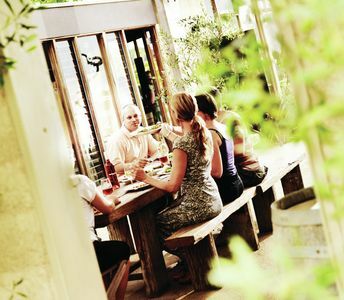 Cellar and Pantry in Red Hill are worth a visit for all manner of unusual and gourmet produce. You can also pick or buy a lot of seasonal produce at the farm gate, including plump berries and luscious cherries during summer. Pick up some local cheese, fresh produce, handmade local chocolates and other goodies for a picnic lunch at one of the Mornington Peninsula’s spectacular beaches. Another good spot is Point Nepean, the coastal town of Finders and Seawinds Garden, a 34-hectare property managed by Parks Victoria with magnificent views of Port Philip Bay, the Mornington and Bellarine Peninsulas. Take a leisurely drive to the Yarra Valley (allow two hours) and check in at your chosen accommodation or head back to Melbourne.